Well I finally cut my teeth on the European race circuit. 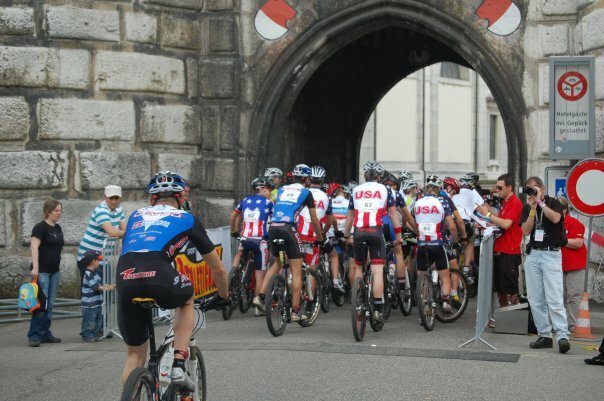 First up was the Swiss Racer Bikes Cup in Solothurn, Switzerland. The Racer Bikes Cup is what replaced the Swisspower Cup, but is the same thing. 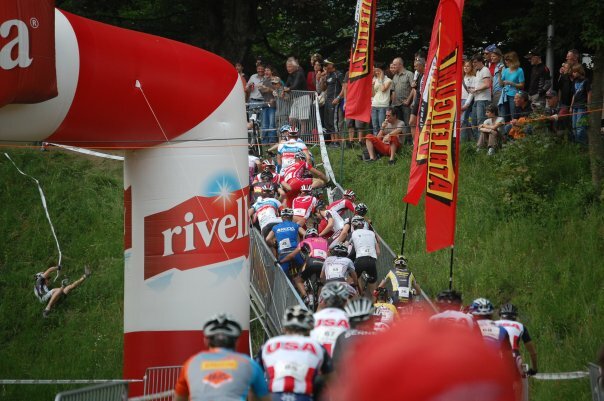 There were 80 starters, among them, Nino Schurter (4x World Champion, Olympic medalist) Florian Vogel, Mathias and Lukas Fluckiger, Marco Aurellio Fontana etc. It was a small World Cup basically. The course was really crazy, about 70-80% of the race was on pavement, but the rest was on relatively difficult wooded single track sections with some really techy steep climbs and three pretty steep chutes/drops. It was really fun, and SUPER fast. I had an okay start, we started right inside a tunnel of a some huge castle in the middle of town. The gun went off and it was full blast. Things were going good, the start was actually not that sketch, the Euro’s are really very comfortable with pack riding/racing and it was the best mass start race I have probably been in. Things were going good for the first lap, moving up little by little. Then on the second lap, right on the second chute, I burped my front tire of the rim and went down hard. I got back on right away and then tried to fill it with a CO2. It wasn’t sealing though, so I had to take it easy on the pavement since I have around 10 psi in it. I limped my way down to the start/ finish where Marc Gullickson and Jimmy Deaton had another CO2. They pumped me up and I kept going. As I got up the first ramp (in photo) and went around a bark chip corner it dropped air again. I quickly put a tube in, used the remaining CO2 left in my canister and then had to nurse about 15psi back up to our mechanic, Joey Ernst in the next tech zone. I got to him after going around 75% speed and he got me going again soon. Around the end of lap two I got lapped by Nino Schurter and Florian Vogel who were going so fast. I hung with them up a single track section then they easily dropped me on a flat. I got to ride the descent with Marco Aurelio Fontana, (5th at the Olympics) and then once we hit the road sections I was dropped. I finished 3 laps down, in last place. Not the best start, but still really fun, and a great experience. 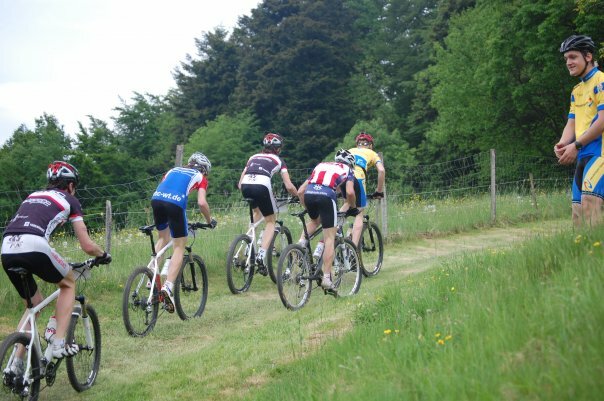 Today, we did a smaller race in Wittau, near Freiburg, in Germany. We rode from Kirchzarten to Wittau, which took us around an hour, then we did a few laps on the 3km course and then proceeded to warming up on some steep roads. We were doing 10 laps today, and it was going to be FAST! After having a poor race yesterday I wanted to prove that I had some legs, but even I caught myself by surprise. 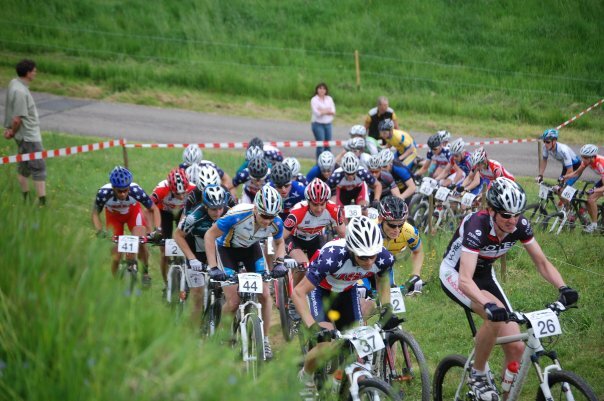 This entry was posted on Sunday, June 14th, 2009 at 9:58 PM and is filed under Peak Cycles Bicycle Shop, Races. You can follow any responses to this entry through the RSS 2.0 feed. You can leave a response, or trackback from your own site.